Bega Valley Shire Councillors recently joined the Bega Valley Advocates for Timor Leste and students from the Sapphire Coast Anglican College for a flag-raising ceremony in Littleton Gardens, Bega, to celebrate Timor Leste Independence Day. Afterwards, the vice president of the Advocates, Dave Gallan reported on the organisation’s recent activities in Natarbora, the community with which the Bega Valley Shire Council has a friendship relationship going back for 10 years. After the Advocates marked their 10th anniversary of friendship with Natarbora last year, Council provided $4,000 to assist Advocates in teacher training, the Days for Girls feminine hygiene program and a cultural day for schools in Independence Week. 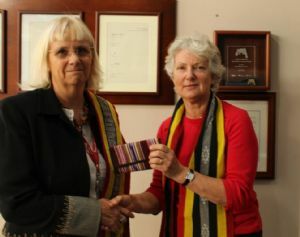 Mr Gallan said the Council donation was an acknowledgement of a debt of honour to the Timorese who cared for Australian soldiers after the invasion of the Japanese during the Second World War. When the Australian forces left, the Timorese suffered cruel treatment for the help they had given the soldiers, he said. Mr Gallan said the Advocates’ focus had changed over the last decade as Natarbora developed. The community is now on the electricity grid with constant power in local homes, and the Timor Leste Government now provides free education for secondary school students. He said that when the Advocates first visited Natarbora the people in remote areas were nearly starving; children were gaunt and it was difficult to tell their ages by looking at them. Now the children are well nourished, the schools are far better resourced, the women in the villages have an opportunity to get the economy growing and the bicycles provided by the Shire’s Rotary Clubs enable children to ride to and from remote schools. The Government now provides school lunches to all children and water is available in all school kitchens. Mr Gallan said that over the years, the Advocates had provided educational resources and books in the Tetum language to 10 schools and provided scholarships for internationally-recognised teaching degrees. Laptops from some of the primary schools in the Shire have been donated to Timor Leste schools. Next year, a scholarship would be offered to a secondary school student to spend a year at the Sapphire Coast Anglican College. On his most recent visit to Timor Leste he was accompanied by Dr Marie Nelson and sewing teacher Sue Pauline who taught young women how to make feminine hygiene products on a treadle sewing machine. Dr Nelson also spoke to the girls about menstruation and how to ensure they don't have to miss any more days at school because they are menstruating. Mr Gallan thanked Council for its support and said the money had provided funds for professional development and prizes for music, sport, poetry and story-telling events which had been held to broaden students’ experiences and help them express themselves.